In recent months IS has attacked many Shia targets in the west of Kabul, where the majority of the city’s Shia population live. 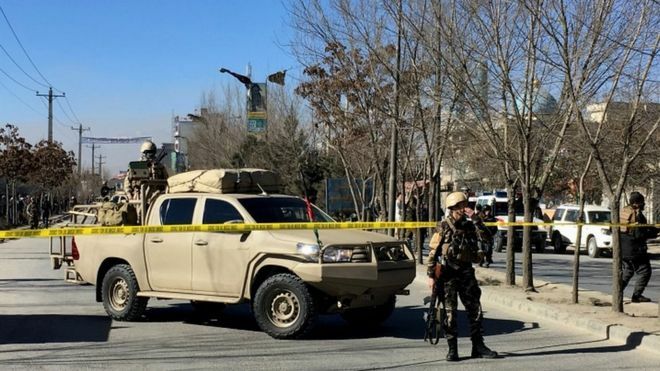 Shiities targeted in suicide bombing in Kabul. Death toll is 40 & climbing. Shiite muslims are considered infidels by the likes of Islamic State. At least 40 people have been killed and 30 wounded in a suicide attack in the Afghan capital, Kabul. A Shia cultural and religious organisation and media offices of the Afghan Voice agency were hit. The interior ministry told the BBC a suicide blast was followed by another two explosions in the area. No-one has yet said they were behind the attack. In recent months, so-called Islamic State has been carrying out attacks on Shia targets across the country. Rafida, also transliterated as Rafidah, is an Arabic word (collective plural Arabic: الرافضة‎, translit. ar-Rāfiḍa; multiple plural Arabic: رافضة‎, translit. Raāfiḍa; singular Arabic: رافضي‎, translit. Rāfiḍī) meaning “rejectors”, “rejectionists”, “those who reject” or “those who refuse”. The word is derived from the Arabic consonantal root ر ف ض, which as a verb means “to reject”. The non-collective singular form is رافضي rāfiḍī “one who rejects”. The term is used contemporarily in a derogatory manner by Sunni Muslims, especially Salafis and Wahhabis, who refer to Shia Muslims as such because Shia Muslims do not recognize Abu Bakr, Umar, and Uthman as the legitimate successors of Muhammad, and hold Ali to be the rightful first successor.